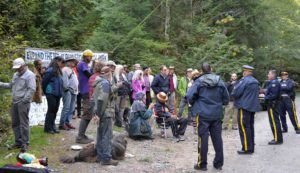 Today, between 10am and 2pm a tense stand-off ensued between shishalh First Nation members, concerned citizens, supporters of Elphinstone Logging Focus (ELF), against Peninsula Logging Ltd. and backed by the RCMP who were onsite to enforce an interim, Ex-Parte Injunction order. For further updates, news, more pictures and videos visit our FB page here. The day resulted in 6 arrests, with Laurie Bloom and Hans Penner of ELF being the first, and threats of arrest to shishalh hereditary member, Willard Joe. One arrestee was a young female protester who used a bike lock to affix her neck to the contractor’s excavator, which took over an hour to undo. Peninsula resultantly agreed not to fall timber until after Monday, Sept, 12th, to allow a Forest Practices Board investigation of the site to proceed, however will begin falling timber next day. The Board agreed with ELF that this BC Timber Sales A87125 block is a significant forest due to it being a Blue-Listed (of special concern on the Endangered Species List), and thus warranted a biologist to examine its plant species in more detail. However, this rare site will eventually be subjected to logging. ELF even attempted to find a win-win solution by identifying a nearby Tree Farm (Age Class 4 (80-100 yrs.) whereby the contractor could log the same volume of wood without destroying this intact, high value, natural forest. This option was not considered by BCTS which directly led to today’s confrontation between people concerned about the Elphinstone Forest and the RCMP.